AKA I was a Tour de France virgin but now I’m hooked on the whole thing! Watching bike racing is pretty new to me. I’ve kept an eye on the all the major races this year but watching the Tour de France is different. I can’t miss it! The Tour de France is pretty important for us guys at Merlin as it marks the peak of the cycling season. I’ve only been here 9 months in total and I already know how much of a milestone it is. There’s an atmosphere around the tour and the media has a big part to do with this. Cycling news channels fill their sports sections with the Tour for 3 weeks. As an avid social media fan it makes it so much easier to follow not only what’s happened in the race but also what the riders are doing and saying after racing’s finished. It almost makes you feel involved. Nearly all the riders use Twitter. They post their feelings on the stage and their ambitions for the day after. They even post what they’re having for their tea! It’s the communication with their fans that makes the Tour even more personal. It took me some time to understand the general format of the race. I was always confused as to why a few riders would lead ahead of the peloton making it harder work for themselves. I soon worked out these guys generally aren’t stage winners and they’re just after a bit of sponsor time if not some points for winning a sprint or climb. I’ve also picked up that riding as an individual isn’t going to win you the Tour. It might win you a stage but the top guys want the whole shebang. Teams have a rider who they’ll work selflessly for to ensure they get him to the front. They’ll take the workload and lead the way so the prospect can drift in their slip stream conserving energy for the last few kilometres of a race. One thing I did understand was the jersey situation. 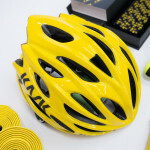 The famous yellow jersey is worn by the fastest rider in terms of overall time. The green jersey is worn by the rider who has earned the most points from the stages. The polka dot jersey is worn by the KOM (king of the mountains) who has earned the most points from the climbs. Lastly, the white jersey is worn by the fastest 25 and under rider – basically a junior yellow jersey. Something that even you veteran Tour de France watchers might not know is the reason for giving the yellow jersey holder a lion teddy at the end of a stage? I did a bit of internet searching and found out it’s a logo of French bank Credit Lyonnaise who’ve sponsored the jersey since 1987. You learn something new every day! Road Cycling UK have even started a fantasy cycling league for the Tour de France. It gives you a budget of €65 million to spend on a team of 9 riders and an overall team which gains you extra points. You can set up your own mini-leagues like we have at Merlin and compete against your friends. I’m ranked around 2100 out of 5000 players so I’m doing alright for a newbie. We’re half way through the second week and well into the mountains, which is a big change to the generally flat early stages. The mountains are more tactical with full team lead outs and late attacks (unless you’re Froome). With Froome taking such a lead early on it looks hard for anyone to make a recovery unless he has a bad day. Quintana and his Movistar team look to be strong in the mountains and if I had to put my money on anyone to catch Froome, it would be him. Comment any unusual facts you have on the Tour de France for me below and let me know who you think is going to take home the Yellow Jersey. Tagged beginner, le tour, tdf, Tour De France. Bookmark the permalink.